STMicroelectronics‘ ST1PS01 step-down converters are engineered for small size, low quiescent current, and high efficiency at all values of load current, to save energy and real-estate in keep-alive point-of-load supplies and IoT devices such as asset trackers, wearables, smart sensors, and smart meters. ST has also added the STEVAL-1PS01EJR evaluation board (block diagram pictured above). Integrated feedback-loop compensation, soft-start circuitry, and power switches ensure a space-saving solution that requires just a few small-outline passives to complete the circuit. The typical inductor value is 2.2µH. In addition, output-voltage selection logic not only saves external voltage-setting components but also gives flexibility to configure modules digitally at manufacture or let the host system change the output voltage on the fly. Eight variants, each with four optional output-voltage settings, allow a choice of regulated outputs from 3.3V to 0.625V. All models feature a Power-good indicator. A wide input-voltage range, from 1.8V to 5.5V, further enhances flexibility for designers by allowing various battery chemistries or configurations as simple as a single lithium cell and extending runtime as the battery discharges. ST1PS01 regulators are also ideal for devices powered from energy-harvesting systems and feature a low noise-architecture that allows use in noise-sensitive applications. The STEVAL-1PS01EJR evaluation board features the ST1PS01 is a nano-quiescent miniaturized synchronous step-down converter that is designed for applications where high efficiency, PCB size and thickness are the key factors. The converter can provide up to 400mA output current with an input voltage ranging from 1.8V to 5.5V. 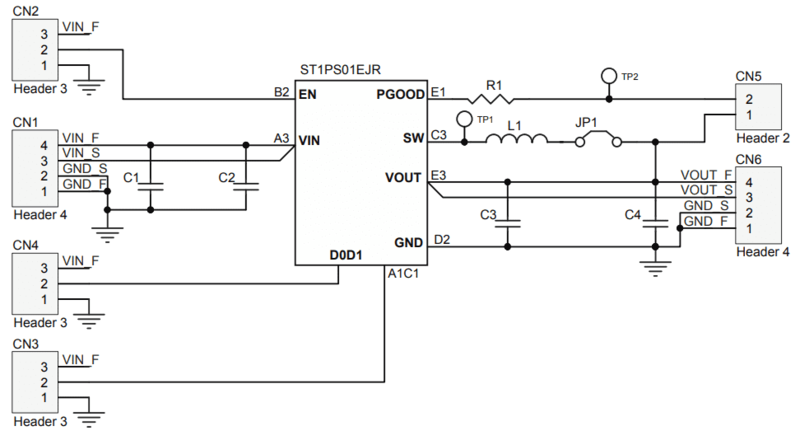 The output voltage can be dynamically adjusted from 1.8V to 3.3V using two digital control inputs. Thanks to the enhanced peak current control (PCC), the ST1PS01 can achieve very high efficiency conversion using only a 2.2µH inductor and two small capacitors. The advanced design circuitry used minimizes the quiescent current. Tiny external components: L=2.2µH typ. ST1PS01 regulators are now in full production, packaged as 400µm-pitch flip-chip devices measuring just 1.11mm x 1.41mm, and priced from $0.686 for orders of 1000 pieces.